Q&A article about my works and how I work was published at BCMG website! Please click HERE to read the article. Ophiocordyceps unilateralis s.l. at BBC Proms! My new piece, Ophiocordyceps unilateralis s.l. will be premiered at this year’s BBC Proms by BCMG with conductor Franck Ollu at Cadogan hall, London on Saturday 25th July. The concert starts from 3pm and it will be on broadcast at BBC Radio 3. Absolutely wonderful time devising and executing artistic direction and composition workshops for production ‘Gauche the Cellist’ for music and shadow puppetry. We toured 4 additional support needs schools in Aberdeenshire, Scotland, giving 8 school workshops, 4 school performances, and 2 public performances in Woodend Barn Banchory, all in one week! Here is a lovely short clip of our show (thank you Symon Macintyre!) The production was made in collaboration with SCO Connect and Vision Mechanics. 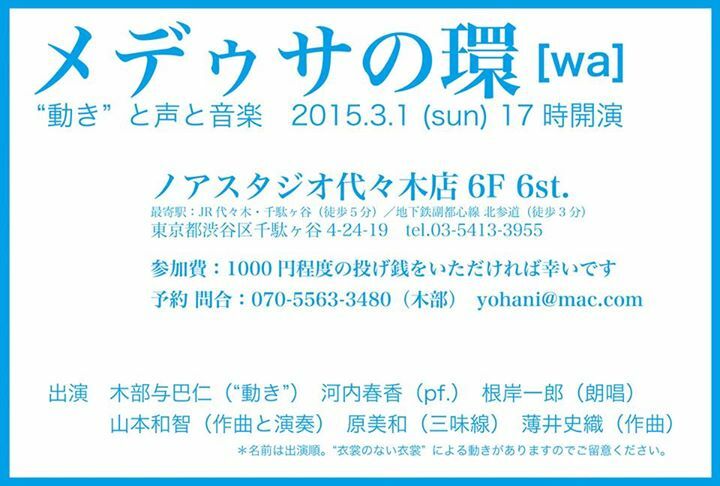 Poet Kibe will dance Inhaling/exhaling at Yoyogi Noa Studio, Tokyo on 1st March. New video of from scratch (Japan version) is now on youtube. This piece was inspired by my experience of having eczema. 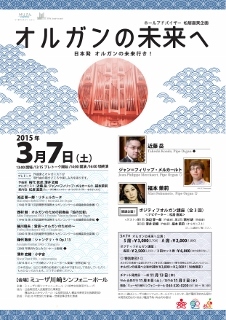 New piece for Organ (with audience participation) will be played at Muza Kawasaki, Japan on 7th March 2015. Audience will make sound with papers, mouth and balloons! 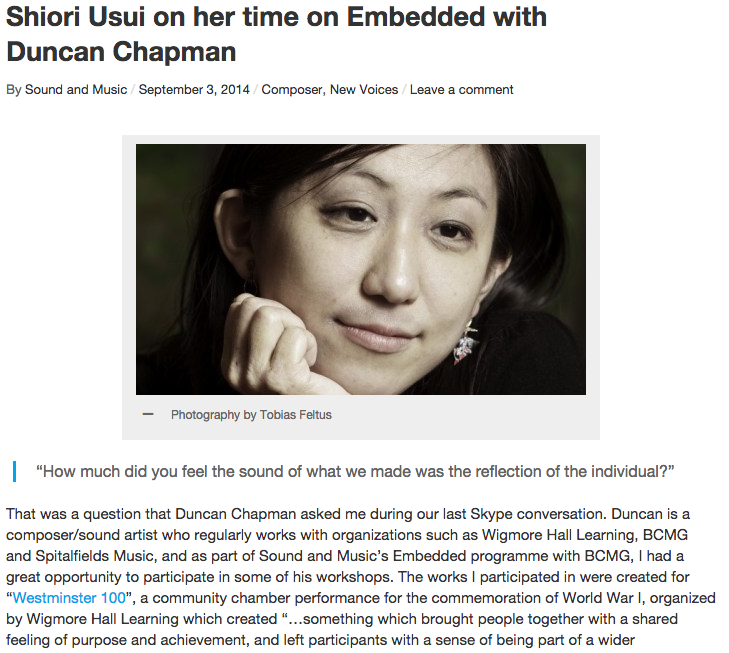 As part of Sound and Music’s Embedded programme with BCMG, I had a great opportunity to participate in some of Duncan Chapman‘s (music animateur) workshops and I wrote a blog about it. Performed at Tokushu Ongakusai (Peculiar Music Festival) in Tokyo! 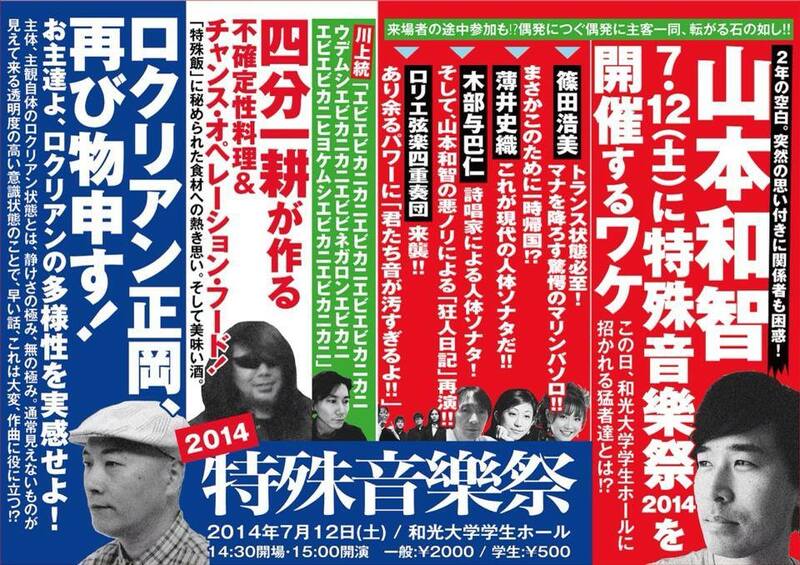 Performed “from scratch” (Japan Version) at Tokushu Ongaku sai (Perculier Music Festival) in Tokyo in July! Such a thrilling festival! Until the next time! 😉 The performance video to follow, watch this space! My recent piece “Deep” composed for BCMG is featured on the current issue of Classical Music Magazine (May 2014).